This Book Could Change You Forever! Take back the Power of Decision in your mind to release worry and doubt as you go through your day. 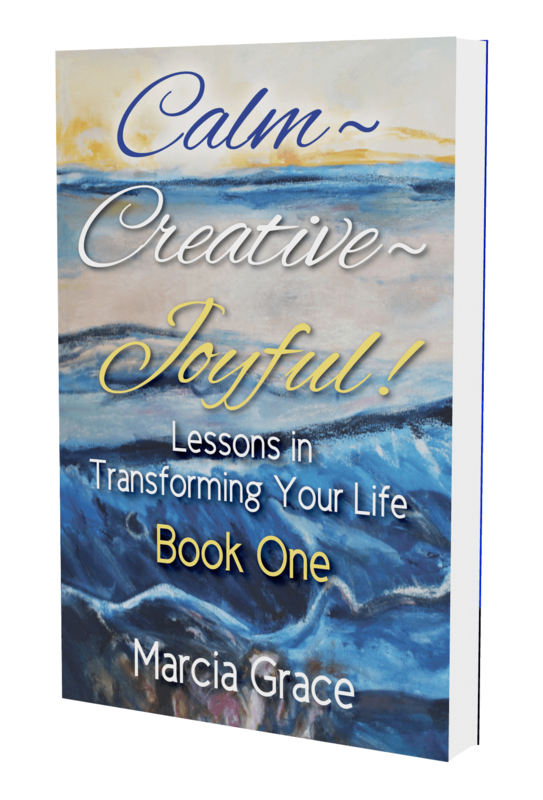 In my new book, Calm, Creative, Joyful: Lessons in Transforming Your Life you will acquire abilities you didn’t think you had, to transform the thoughts that hurt so that your life becomes a play of endless opportunities for happiness. The book is a daily inspirational reader offering you new and fresh ways of perceiving your world. Based on the lessons in the Workbook of A Course in Miracles, you explore the profound ideas inherent in each daily lesson with me. Then I give you the chance to put them into action. It’s in the doing that real change takes place! I know what it’s like to feel powerless, afraid and uncertain of what misfortune might be right around the corner. I know how embarrassing it is to be asked a question, and not be able to speak an answer even when you know what it is. I know how it feels to see others’ success and wonder why it hasn’t happened to you. Imagine being able to look at all your fearful, self-doubting thoughts and laugh at them! In Calm, Creative, Joyful, that is exactly what you will learn how to do. Thirty+ years ago, I was a nervous, shy and insecure person. Only child of a divorced woman, I was basically on my own since my mom worked every day in the city. I grew up fast, had a disastrous 1st marriage at 17 (I won’t go into the gory details here! ), went to work in New York City, met an older man and married again a month before my 22 birthday. I vowed “This time I’m going to make this marriage work!” And I did. We were married for over 40 years when my husband died. While raising my 2 children, I began an intensive spiritual journey which took me from Unity’s Daily Word to delving into the world’s religions and philosophies until one day, my yoga teacher said an amazing thing. “I’ve been studying A Course in Miracles, and it’s changed my life!” The intensity of his words inspired me to attend a workshop on the Course later that week. 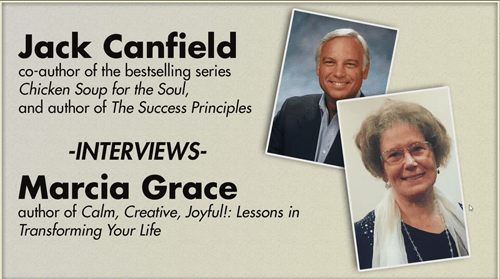 This is the goal I offer you if you will join me on a journey through these lessons. Know that I will be crying and laughing with you as you wend your way through the ego resistance in your mind toward the peace and serenity you deserve. I know you may be a little skeptical that you can disrobe yourself of your ancient fear and doubt. I’ve been there, too. There’s work to do, but once you set your eyes on the goal, it will be easy to press on. The first step — deciding that you need to change your thinking so your life can change for the better — is the most difficult. If you can admit this now, you’ve gotten over the biggest hump. And, if you’re like me, even in your darkest hours, you believe there must be a better way to live life. There is! And I show you the way in these daily lessons. All you have to do is show up and be open to new ideas. By the way, this is NOT a book of affirmations or prayers, per se. (Not that both of these are not helpful!) It is also NOT a bunch of feel-good stories that prove how different and hopeless you are. These lessons show you how powerful you really are; how to take charge of your thoughts instead of being their victim. Are you willing to try something different? Are you willing to devote a little time each day to reading the lesson? Are you willing to change the thoughts that are hurting you? As a reader of this book, I won’t leave you to strike out on your own at the end. Simply contact me (we’ll link to your contact page: the email address will bring you TONS of spam), and you will receive the review days for ALL the lessons so that you can strengthen your resolve to stop finding fault and love yourself! And just as all ‘negative’ feelings are the same in that they keep you from living your best life, so are the leaps of joy as you allow miracles to transform them. By now, you know the immense benefits that await you as you spend your daily ‘special time’ with Calm, Creative, Joyful. Be the first to start your transformation when the book comes out. Enter your name here to be put on the pre-publication list. And please remember, You Are Not Alone. Reach out, and the net will be there to catch you!